Welcome to the second part of the tutorial series on how to generate a PDF using Quartz 2D! In Part One, we set up an app framework for the PDF, and we drew some rudimentary text and lines with Quartz 2D inside our PDF. 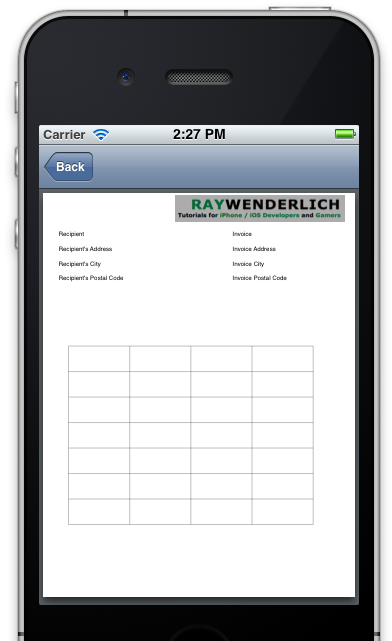 Since our PDF will be an invoice document, it needs to look professional. 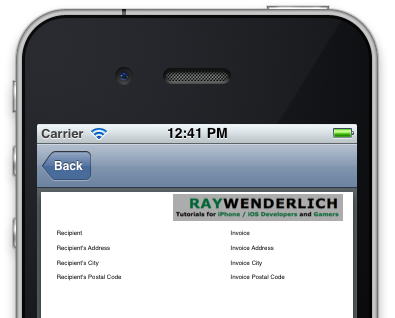 To accomplish this, here in Part Two we’ll be adding a logo image and drawing a table to hold the invoice data. By the end of this article, our PDF will be complete. Go ahead and download the image, then add it to the project. To do this, control-click on the PDFRenderer group in the Project navigator and choose “Add Files To iOSPDFRenderer.” Select the ‘ray-logo.png’ image you downloaded and then click Add. Yes, drawing an image with Core Graphics is that easy! All we need is this one-liner to draw an image to the current context. The method takes in the image we want to draw and the frame where it will be drawn, and draws the image into the context. In the code above, we create a UIImage from the image file, define the location and size of the image to be drawn, then call the drawImage method we created above with these two parameters. Now if you run the application in the simulator, you’ll see our PDF as we left it in Part One, only now with Ray’s logo. Of course, it still looks pretty crappy. Time to fix that! 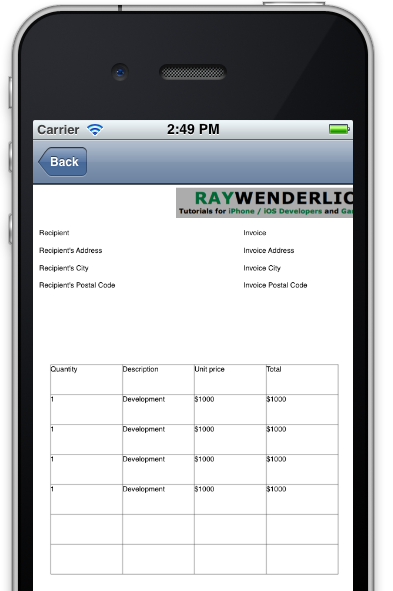 At this point, we know how to draw the basic elements of the invoice: text, lines and images. The next step is to combine all the elements to create a polished layout. To do this, we’ll use a little trick. 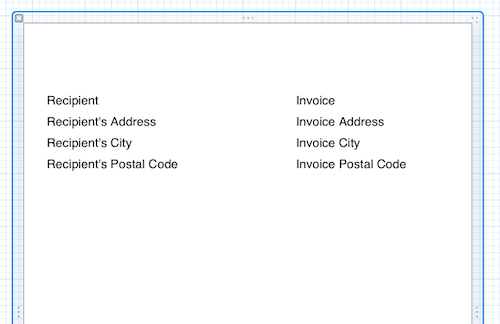 We’ll create a View in the interface builder and add the elements for the invoice. Then we’ll use the locations of the views to make the layout. This will make things a lot easier because we can visually layout the PDF, and won’t have to hard-code as many coordinates for drawing. Don’t worry, it will begin to make sense as we do it! 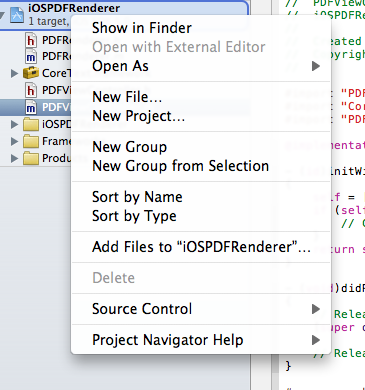 Create a new View in the application by choosing File\New\New File. 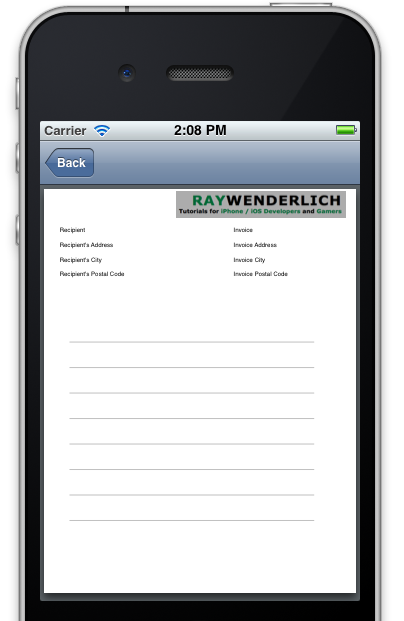 Select the iOS\User Interface\View template and click on Next. Make sure the Device family is set to iPhone and click Next. 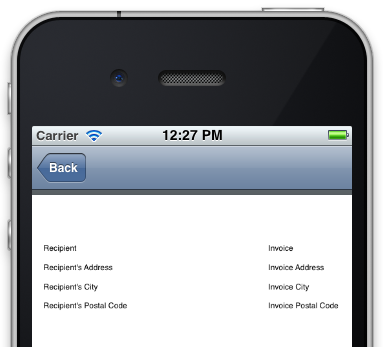 Give the new View the name InvoiceView and click Create. 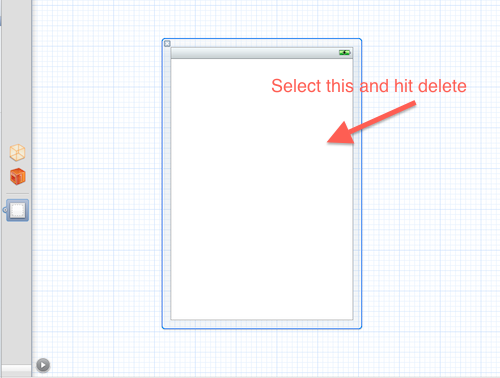 Select the View on the Interface Builder and delete it by hitting the backspace button. Add a new View from the Objects tab onto the canvas. Resize the view to be 612 wide and 792 tall. 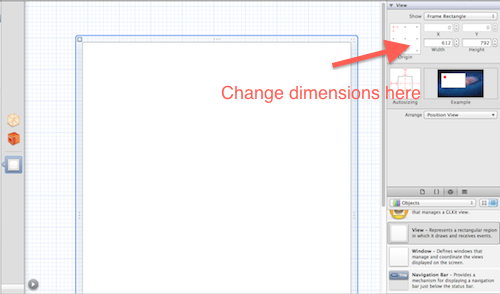 These are the default dimensions for an A4 PDF file. The positions of these labels will form our layout for the invoice. Give each label a tag from 0-7. 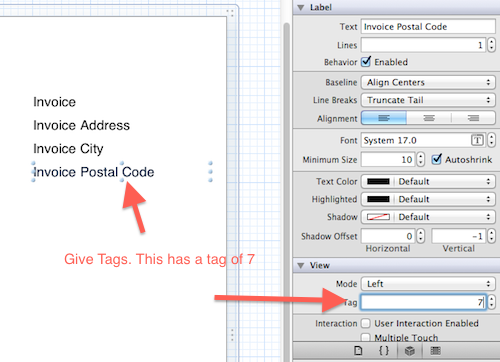 For example, the label “Recipient” will have a tag of 0, “Recipient’s Address” will have a tag of 1, and so on. We’re done with the layout view for now. We’ll come back to it in a bit. But first we need to open PDFRenderer.m and refactor the drawText method. We want to pass in the text to be drawn and the frame that will encompass it, rather than hard-coding it in. This will load the labels from the InvoiceView, loop through all the labels and call the drawText method with its text and frame variables. // Close the PDF context and write out the contents. Let’s try it out! 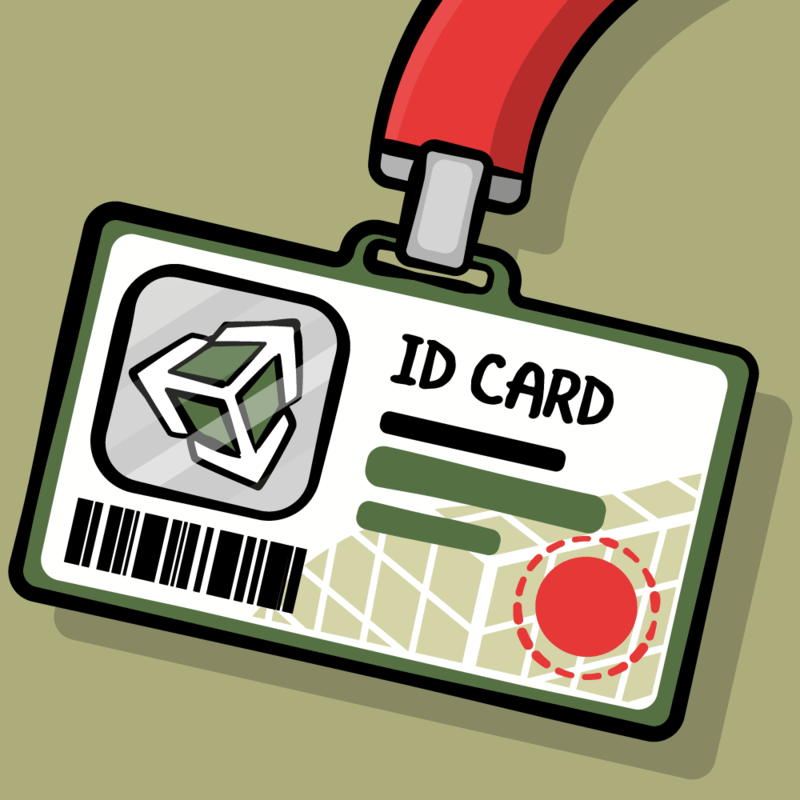 Run the application in the simulator, and you will see something similar to the image below. Yikes – it looks like garbage, right? That’s because the text is being flipped and translated multiple times in the the drawText method. Up until now, we’ve only drawn one line of text, but the problem arises when we want to draw multiple lines of text. // Modify this to take into consideration the origin. // Add these two lines to reverse the earlier transformation. Now run the application again. You should see a nicely laid-out PDF with all our labels mapped. 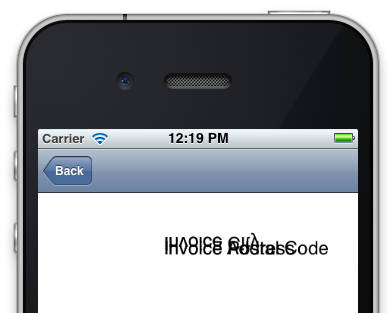 This loads the UIImageView from the Xib file in the same way we load the labels. 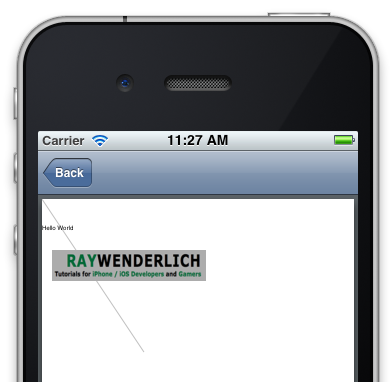 Then it draws the logo onto the PDF using the coordinates of the UIImageView. 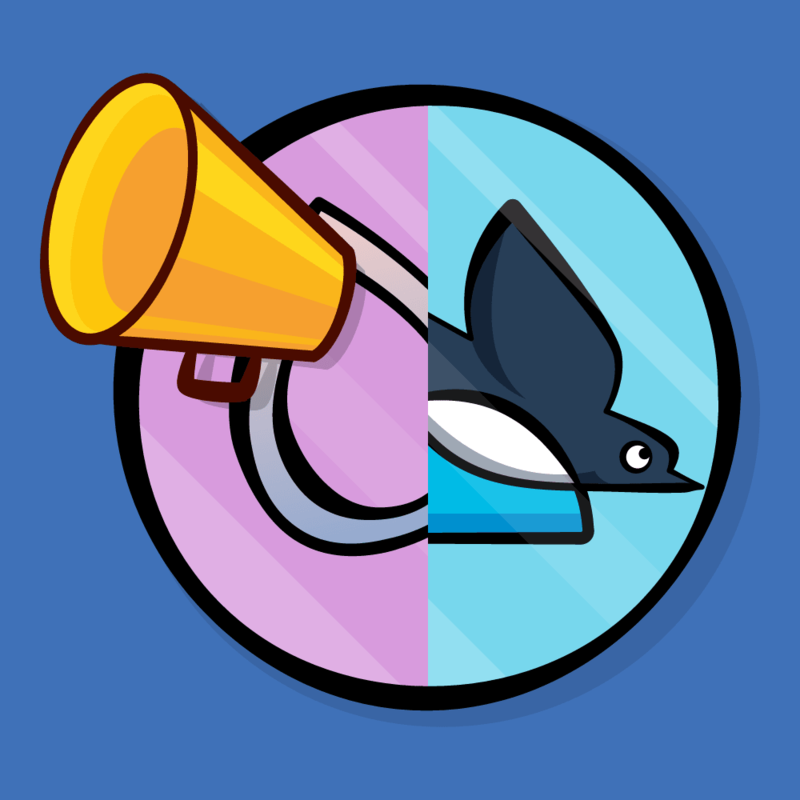 Run the application in the simulator, and you’ll see the logo in the top right corner just as we specified! Pretty cool how easy it is to visually lay out the PDF with the aid of UIView coordinates, eh? 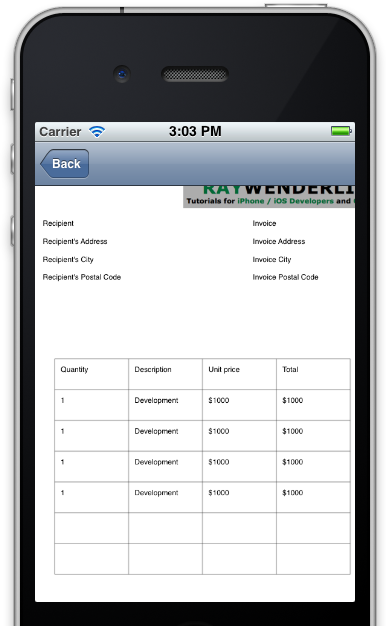 It’s time to add the table that will hold all the invoice information. Our table will be nothing more than an arrangement of vertical and horizontal lines. In this case, we won’t use the InvoiceView. Instead we’ll use a series of variables like the table height and width, and the row height and column width. This method draws our horizontal lines. At the beginning of the method, we pass in the values for the starting position of the table, the number of rows and columns, the height of each row and the width of each column. Run the application in the simulator and you should see the horizontal lines on the PDF. The second loop in the above code does a similar run through all the columns in the table, calculating the start and end points of each line and drawing the line to the PDF. If you run the application again, you will see that our table is complete! But what use is a table without data? We're going to manually add some dummy data to our table using a series of arrays. But you could easily modify this to feed in data inputed by the user. This code block begins by creating the data that will be in the table. The first array contains the values that will be in the header (first row of the table). The next three arrays contain the values for each row and column of the table. The final array is a master array containing all the others, effectively making it a two-dimensional array modeling our table data. After that, there are two nested loops. The outer loop runs through each row and extracts the data for the row. The inner loop runs through each column and calculates the starting point of the text, depending on its location in the table. It creates a frame for the text and then draws the text in the frame. Run the application in the simulator and you will see our table is populated with data. Looks good, doesn't it? But let's make one final tweak: we could use some padding between the table lines and the data itself. That's all folks! This tutorial series should have given you an idea of how to use Quartz 2D to generate a PDF displaying results from your app. From here, there are many implementation possibilities! As I said at the beginning of this tutorial series, going through this project should have also helped you appreciate all of the low-level layout Apple gives us for free in the UIKit. I look forward to reading your questions and comments in the forum discussion below!